Preventing acne or preventing mild to moderate acne from coming back once you have blemishes cleared up is not hard. It just requires using the right products in the right ways. Here are eight ways to prevent acne that work every time. Eating yogurt can help prevent acne. The most frequently overlooked way to prevent acne is to keep pressure off the skin. Any kind of strap can leave acne in its wake. Skin needs to be cleansed without rubbing and scrubbing to keep acne at bay. Being ready to treat a single pimple when it pops out can help you stop many more. Chocolate can cause acne, and yogurt can prevent it. Moisture keeps the skin flexible so pores can drain. Facials that don’t irritate the skin feel good and keep pores from getting clogged. Remember to wash off all the facial, of course. “Peeling” the skin keeps dead skin and sebum from accumulating in pores. Exposed Skin Care has a gentle peel that works on all skin types. 1. Avoid constant pressure on your skin. Getting acne off your cheeks and forehead is hard. Getting acne off your chin, shoulders, and back is nearly impossible. It is much easier to prevent acne in awkward places than it is to treat it, and one of the most important ways to stop acne before it starts is to avoid constant pressure on the skin1. Violinists often get chin acne, due to constant pressure on the jaw while holding the instrument. Preteens may break out with acne where straps for backpacks wear on their shoulders, especially if the experience of going to school is otherwise stressful. Young football players pop out pimples where they didn’t pimples could pop out, when protective sports gear is a size too small or secured too tight. Retainers cause acne while they straighten teeth. And brassiere straps are a cause of acne for all ages. If you can’t avoid pressure on your skin, you can at least compensate for it. Remove tight, sweaty clothes as soon as possible. When possible, wear uniforms or work out clothes made of cotton instead of nylon or Lycra. Cotton “breathes” better. When you shower, exfoliate your skin with a shower mitt, but don’t rub so hard your skin feels raw or looks red. And make sure you wear clean clothes every day. This way you don’t constantly reinfect your skin with acne bacteria. 2. Keep your skin clean, but not too clean. Next to chanting “Die, acne, die,” trying to scrub your acne away is one of the least effective common methods of acne prevention. You don’t have to kill all the bacteria in your pores and rub away every last dead skin cell to keep acne from popping out. All you have to do is to prevent the combination of clumps of dead skin and excessive bacteria from accumulating in your pores, where they can get trapped under excess sebum. There are two important things to remember about washing your face if you have acne. One is to let your cleanser do all the work. You don’t need to rub your face clean with a wash cloth. You don’t need for your face to feel tingly. If you irritate your skin, it will repair itself by making even more skin oil2. The other thing to remember is to stay clean once you get clean. Don’t spend half an hour and $10 cleaning your face and then towel it dry with a dirty towel used by someone else. Once you get acne bacteria off your face, don’t put them back on your face with dirty towels or dirty hands. Wash your hands before and after you touch your face. 3. Don’t eat dark chocolate. Many people who have acne can get away with eating milk chocolate. Some people who have acne can keep their skin clear even if they eat dark chocolate. Chocolate-sensitive individuals, however, can break out in dozens of whiteheads, blackheads, and pimples after eating dark chocolate3. The effect usually occurs after the second bar is consumed in a single week. 4. Be ready to fight pimples as soon as they break out. The sooner you treat a pimple, the sooner it can heal. But treating a pimple never involves popping it. The way to treat a pimple is by killing the bacteria inside and letting your skin do the work of repairing your skin. Different skin types respond to acne treatments in different ways. If you have black skin, use the lowest strength of benzoyl peroxide you can find (under 2.5%) and use that to treat the pimple in the morning. Put some vitamin E cream on the pimple at night to avoid spotting of the skin as it heals. You can also use arbutin powder on the pimple—but not on surrounding skin—to lighten the skin as it heals. If you have Asian skin, try a foaming sulfur product in the morning with topical tretinoin in the morning. The sulfur doesn’t smell great, but you should not use any product that includes a fragrance to make it smell better, because these fragrances can cause browning of the skin4 after the pimple heals (postinflammatory hyperpigmentation). Use topical tretinoin at night to open the skin. If you have light brown or fair skin, try vitamin C (in the form of ascorbyl palmitate) in the morning and benzoyl peroxide (up to 10%) at night. Be careful with benzoyl peroxide. Just use it on the pimple, and don’t let it bleach hair or clothes. 5. Keep your skin moist. Locking moisture into your skin can unlock your pores so sebum, bacteria, and dead skin can come to surface to be washed away. No one should ever use an alcohol-based moisturizer. Water- and even oil-based moisturizers keep the skin flexible5, keep pores open, and add natural color to the skin. If you don’t use makeup, even a splash of water in your face several times a day will help keep it moist. Facial masks you wash or peel off your face soak up extra oil and loosen dead skin. It’s hard to go wrong with a facial for preventing acne, but there is no need to spend a fortune on products. Any face mask that feels good probably is good, but you don’t want anything that leaves your skin feeling tingly or looking red. Sulfur in face masks6 is OK if you have Asian skin, but probably not a good idea if you have fair skin with small pimples. Any mask that is hard to peel off can irritate your skin. Facials should be fun and easy to clean up. 7. 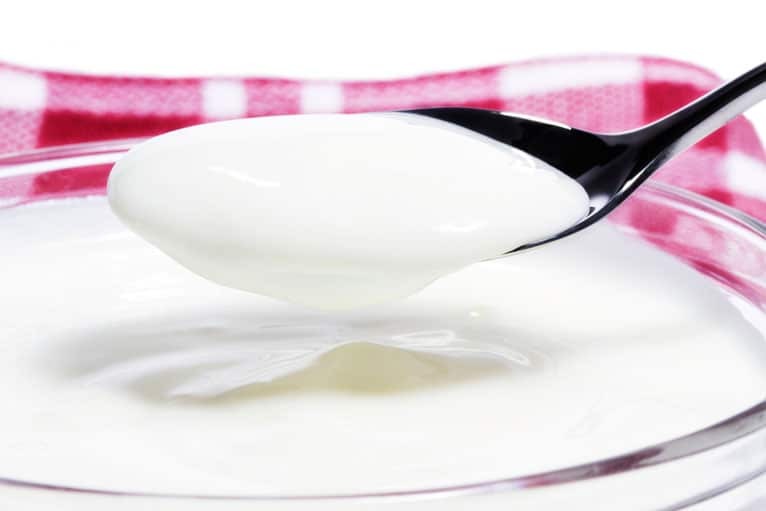 Eat probiotic yogurt, or take probiotic supplements. Yogurt is not a particularly useful product for making face masks, but it is a very useful product for helping maintain probiotic bacteria in your colon. These friendly bacteria can “train” your immune system7 to fight acne bacteria while doing less damage to your skin. The way acne damages is the skin is through inflammation, but it is the immune system that creates the inflammation, not acne bacteria. A particularly nasty pimple, if it’s not actually a staph infection, is caused by the immune system’s attempt to get rid of both bacteria and the skin in which they reside. Lactobacillus bacteria in the colon can teach immune system that it is not necessary to fight them with inflammation to stay healthy. The immune system in the colon transfers this knowledge to the immune system in the skin, and helps the face stay clear. Try it. Any kind of yogurt that contains live cultures can help your skin8. 8. Peel, but don’t mash. Mashing, smashing, tweezing, poking, probing, and lancing pimples never works. The action of destroying the skin to save it only forces bacteria deeper into the skin9 where they can never be cleansed away. Peeling dead skin off the surface, however, stimulates the production of new collagen underneath the skin, helping fill in acne scars and fine lines and wrinkles. And it loosens the skin so pores can drain and heal acne on their own. A great source of skin peels that work is Exposed Skin Care. The skin toners provide just the right amount of alpha-hydroxy acids10 to rejuvenate any kind of skin. Mills OH Jr, Kligman A. Acne mechanica. Arch Dermatol. 1975 Apr;111(4):481-3. PubMed PMID: 123732. Draelos ZD. The effect of a daily facial cleanser for normal to oily skin on the skin barrier of subjects with acne. Cutis. 2006 Jul;78(1 Suppl):34-40. Vongraviopap S, Asawanonda P. Dark chocolate exacerbates acne. Int J Dermatol. 2016 May;55(5):587-91. Desai SR. Hyperpigmentation therapy: a review. J Clin Aesthet Dermatol. 2014;7(8):13–17. Purnamawati S, Indrastuti N, Danarti R, Saefudin T. The Role of Moisturizers in Addressing Various Kinds of Dermatitis: A Review. Clin Med Res. 2017;15(3-4):75–87. Gupta AK, Nicol K. The use of sulfur in dermatology. J Drugs Dermatol. 2004 Jul-Aug;3(4):427-31. Review. Maldonado Galdeano C, Cazorla SI, Lemme Dumit JM, Vélez E, Perdigón G. Beneficial Effects of Probiotic Consumption on the Immune System. Ann Nutr Metab. 2019;74(2):115-124. Kober MM, Bowe WP. The effect of probiotics on immune regulation, acne, and photoaging. Int J Womens Dermatol. 2015;1(2):85–89. Published 2015 Apr 6. Tran D, Townley JP, Barnes TM, Greive KA. An antiaging skin care system containing alpha hydroxy acids and vitamins improves the biomechanical parameters of facial skin. Clin Cosmet Investig Dermatol. 2014;8:9–17. Published 2014 Dec 19.